I usually make homemade salsa using fresh tomatoes, even better when they are straight from the garden. However, in the winter months there’s no garden to pick fresh tomatoes from and the tomatoes available from the grocery store are mediocre at best. So I decided to use canned tomatoes (Red Gold is my brand of choice), the ingredients I usually use in my fresh tomato salsa, and my food processor. Boy am I glad I did! I made this salsa about half an hour before dinner. By the time dinner was ready half the salsa was gone and I was still fighting off hungry family members! They wouldn’t stay out of the kitchen. Of course, it didn’t help that after I taste tested it myself I let everyone else have some too. There was nothing left to save for the next day. The beauty of it was that it was fast and tasted great, a definite keeper in this house! I prefer the flavor of Red Gold for my canned tomatoes. You can use whatever brand you like or use your own homemade canned tomatoes (I haven’t become a good enough gardener for that yet, but I’m getting there!). Layer ingredients and run through your food processor! 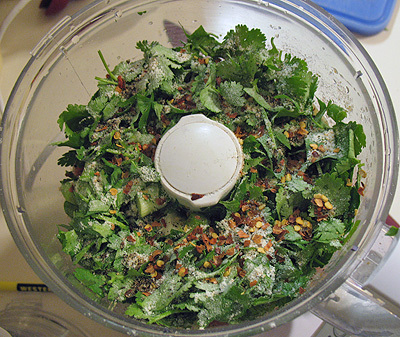 This is one of the easiest food processor recipes you will ever make. Serve with your favorite taco recipe or tortilla chips. 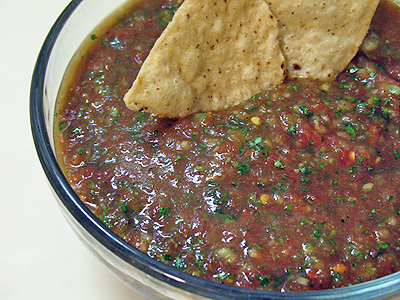 You can also use this salsa in this fabulous hot fiesta dip, great for Game Day! Layer ingredients in the food processor in the order they are listed. Pulse a few times to get the ingredients mixed together. You can continue using the pulse feature if you like your salsa a little chunky. I process mine for about 30-45 seconds or until it looks good. Wanna have ’em sayin’ “mmmmm” and scratchin’ their heads?….when nobody is lookin’ toss in 1 or 2 (depending on how big of batch) finely diced dill pickle spears! Add conservatively to taste! do you think you could can this? really into canning this year! Hi Toni. I don’t recommend canning something that was already canned once (the canned tomatoes). I had asked the same question ages ago and that’s what I was told. G’day Amanda! 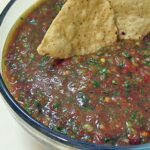 When you need to make a quick Thermomix salsa for entertaining, your recipe is a winner! Love your photo and glad I found! Here’s a photo should you wish to view! Awesome, so glad you liked it Joanne! I was wondering if I make this salsa (whitch sounds great) if I could can some for later? thanks. How can I receive your newsletter I love it. it’s not recommended that you re-can something that has already been canned. However, you can certainly freeze it! 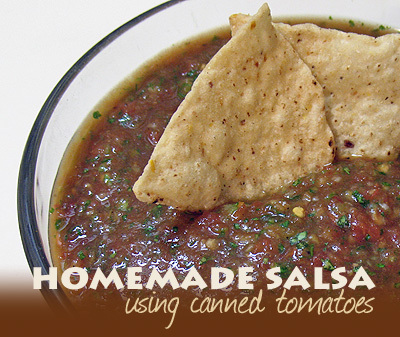 My family has always used canned tomatoes for home made salsa. 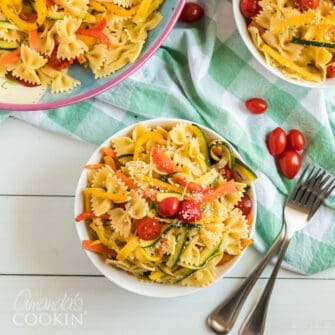 We have never tried to can the recipe yet but would love to try. We do freeze the reciepe though,you can use plastic or glass jars. If using glass jars don’t fill all the way to the top. When taken out of the frezzer, let thaw and shake the jar and enjoy. What is great with this is you can make plenty ahead of time and save for company that shows up anytime. I never thought to freeze it, excellent tip! Loved this salsa recipe. I have an overabundance of canned tomatoes and was looking for a way to use them up. I've been making this salsa twice a week because my family loves it so much. Thanks!